The use of very fine, sterile, disposable needles, inserted at specific points to produce a physioilogical response in the body. Todays acupuncture utilizes, a modern neurophysiological approach, to the ancient practice. We are able to cross reference traditional theory, with the known bio-chemical understandings, to produce consistant reproducible and durable successful acupuncture therapies. Modern imaging technology has allowed us to see specifically acupunctures effects on the pain management systems in the brain, this allows us to intentionally target specific receptors that release neuro-peptides. Acupuncture has the ability to reset dysfunctional visceral autonomic reflexes for improved organ function and depolarize excited overstimulated nerve roots for natural pain control. 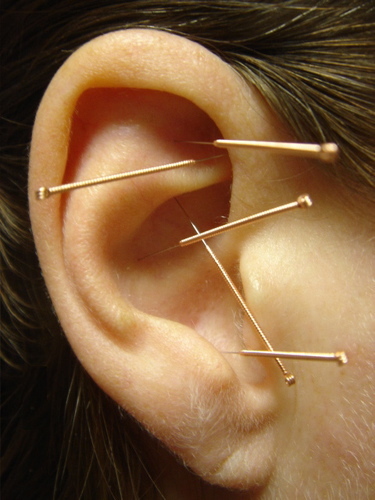 This therapy is an acupuncture treatment performed on the ear. The ear is regarded as a complete representation of the body (micro system) and is able to affect all aspects of physiology. This procedure strongly promotes Qi and blood in the channels and adjusts organ functions. Electrostimulation is commonly referred to as electroacupuncture. Electroacupuncture is quite similar to traditional acupuncture in that the same points are stimulated during treatment. As with traditional acupuncture, needles are inserted on specific points along the body. The needles are then attached via small clips, to a device that sends electrical currents or pulses into the body. These devices are used to adjust the frequency and intensity of the impulse being delivered, depending on the condition being treated. Electrical currents have stimulating effects, which can influence the cells, tissues and entire systems. Electroacupuncture uses two needles at a time so that the impulses can pass from one needle to the other. Several pairs of needles can be stimulated simultaneously, usually for no more than 30 minutes at a time. 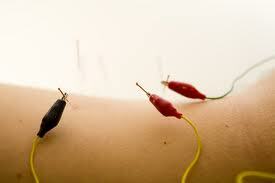 During electroacupuncture, you may experience tingling or mild involuntary muscle twitches. These are normal, temporary effects of the electricity entering the body. Electroacupuncture allows us to intentionally target specific receptors that release neuro peptides. Additionally electroacupuncture can reset dysfunctional visceral autonomic reflexes associated with improving organ function. Lastly it allows us to depolarize excited (angry) overstimulated nerve roots associated with chronic pain. We are writing the book on Earthing Acupuncture. Get the benefits of the earth’s negative electrons through the needles into the earth (Yin) meridians. You won’t believe the results. This Qi energy is at the root of Chinese energy medicine. Taiqi, Qigong, etc. This is a unique treatment developed by Joel Thielen. Go to earthing.com for more information. The AMA adopted a policy that said physical therapists and other non-physicians practicing dry needling should — at a minimum — have standards that are similar to the ones for training, certification and continuing education that exist for acupuncture. “Lax regulation and nonexistent standards surround this invasive practice. For patients’ safety, practitioners should meet standards required for licensed acupuncturists and physicians,” AMA Board Member Russell W. H. Kridel, M.D. As Dubuque’s First Licensed Acupuncturist, I was somewhat surprised by the content in an article posted online titled, Dry Needling by Physical Therapists Ignites Turf War With Acupuncturists. It seemed to be an unbalanced viewpoint on the practice of dry needling by physical therapists. “Dry Needling” by definition, is an invasive medical procedure in which an acupuncture needle is inserted into a specific target of soft tissue in order to improve or restore function and/or control pain. The term “dry needling” is used to differentiate this procedure from injections performed with a variety of injectables such as procaine, lidocaine, serotonin antagonists, etc. Injection therapy was used beginning in the 1940’s to treat myofascial pain. Dr. Janet Travel used many different medications and compounds injected into trigger points (painful areas) with good effect. Later it was discovered that needling the trigger points with a hypodermic needle and no injection, had the same positive results, thus dry needling came into being. Dr. Travel was a medical doctor and was using hypodermic needles to perform “dry needling”. Today the use of acupuncture needles, to perform dry needling is not a turf war, but a clear infringement on an Acupuncturist’s scope of practice. The FDA regulates acupuncture needles as a Class II medical device subject to FDA prescription regulations and has been explicit that the sale of acupuncture needles “must be clearly restricted to qualified practitioners of Acupuncture as determined by states (61 Federal Regulation 64 616). Acupuncturists are extensively trained in Western biomedicine and take competency tests and national board exams in Western biomedicine. About 50% of an acupuncturists education is in Western biomedicine. The Chinese medical system and Western biomedical model are identical, simply different languages. Chinese Medicine was brought into alignment with Western biomedicine in the early 1950’s. There are many arguments stating “dry needling” is not acupuncture yet the treatment of painful trigger points in Chinese Medicine dates back to Nei Jing Ling Shu 206 BC – 22 AD. 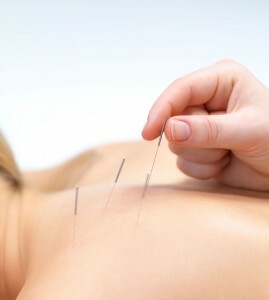 96 – 97% of all acupuncturists use a technique identical to dry needling. There is a clear effort to redefine identical medical procedures in an attempt to circumvent existing regulations. This might come as a surprise to many readers but there is absolutely zero oversight of the practice of dry needling, no curriculum requirements or competencies exist, and it is not taught in schools. Several separate courses are currently being taught to physical therapists and other allied health professionals, one by a licensed acupuncturist; and no clinical supervision is included. The insertion and removal of needles is not a procedure that can be mastered in a 16 hour weekend course no matter your background. Keep in mind eight states require medical doctors to do an additional 200-300 hours of training, prior to being allowed to practice acupuncture. It is concerning that there appears to be little oversight by many physical therapy boards when it comes to the further expansion of the use of acupuncture needles and needling procedures. The primary purpose of medical boards is the protection of public safety. Scope of practice expansion would be moving from hypodermic needles to acupuncture needles, or from trigger point needling to distal point needling. There seems to be a disregard for the regulated, licensed practice of acupuncture, which is regulated by the Iowa Board of Medicine. Physical therapists online share information about an interesting publication by Yun-Tao-Ma titled Biomedical Acupuncture for Sports and Trauma Rehabilitation, which describes 24 “acu-reflex points” and trigger points that have “homeostatic” action to be used by the practitioners of dry needling. The issue here is there is already a form of acupuncture called Medical Acupuncture, which is regulated at the state level, by boards of medicine. Dry needling, by definition, and by practice is Acupuncture. Japanese acupuncture is superficial dry needling. Chan Gunn introduced a type of dry needling that moved away from using intramuscular trigger points. Over 93% of the points he used were documented acupuncture points. Fourteen of fifty state physical therapy boards have determined dry needling to be within the scope of practice of a physical therapist. Many states have not ruled and some like Iowa take positions that “do not preclude a physical therapist from performing dry needling”. Jan 2, 2014, the Utah Department of Occupational and Professional Licensing proclaimed “dry needling is acupuncture”. Seven states specifically prohibit the use of “dry needling by physical therapists”. Sports trainers, chiropractors and massage therapists are now taking the 16 hour weekend courses in “dry needling” and performing the invasive procedure because as they claim, it is not acupuncture, and is not regulated as acupuncture. Since when can we rebrand an existing medical procedure, rename FDA cleared medical devices for other unapproved purposes, circumvent all oversight, and bill insurance as a manual therapy? Improvement and evolution within the different fields of medicine should be encouraged, but we need to respect regulations put in place to protect the public from harm. There are real risks associated with the use of acupuncture needles by physical therapists and other allied health professionals who lack the education and supervised clinical training of Licensed Acupuncturists. Canadian Olympian Kim Ribble-Orr had her lung collapsed from dry needling, leaving it permanently damaged. Licensed acupuncturists are required to pass extensive competency tests, and complete 1950-4200 hours of post graduate training. The article in the Telegraph Herald has spurred me to write this viewpoint and reconvene the Iowa Acupuncture Association. We will continue to protect our scope of practice and are currently working with the Iowa Board of Medicine for review.